>I found some wonderful fortune-telling cards today. As far as I can tell it’s a Nile 68x deck from the US Playing Card Co. c.1904, but distributed in this country by Foulsham & Co as The Gypsy Bijou Deck. 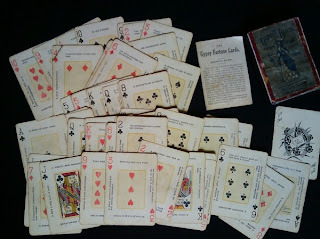 BUT Foulsham & Co. also had a deck out in 1910 called the Gypsy Bijou with was very different having 36 illustrated cards. The art work on my deck box is the same, however the words “Made in the USA” appear on my box, whereas the 1910 box didn’t have that printed on it. So did Foulsham briefly sell the Nile 68x as the Gypsy Bijou deck around 1904, before making their own deck in 1910? The Box I have looks a lot like the original Nile 68x box, but with a Foulsham label. I’m not sure of their UK history, but I’m loving these cards.